The Pet Loss Support Hotline is supported primarily by private donations. It is the financial support of individuals, veterinary practices and associations, groups, private foundations and pet-related industries that make the Pet Loss Support Hotline possible. 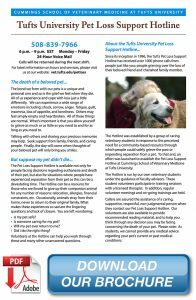 Please make your check payable to Trustees of Tufts University and note that it is for the Pet Loss Support Hotline. Your contribution is tax-deductible, as provided by law.